When we’re traveling we love to get restaurant recommendations from locals. If you know a local travel writer who covers the area that’s even better. Craving some good barbecue on a recent trip to Loveland, Colorado, we reached out to a local blogger we know and asked where we could get the best ‘cue in town. The answer came back promptly: Boar and Bull. A peek at their website revealed that Boar and Bull is a butcher shop, deli, and tavern. Intriguing! We headed over and discovered a large room with tables for dining, a pool table, a small stage and a butcher counter filled with some of the best-looking meat we’ve encountered. Business was a bit slow when we arrived so we got a chance to talk with the enthusiastic owner, Austin Almquist who told us that he sources all the grass-fed meat from farms within 100 miles of the shop and they’ve “…NEVER had hormones, antibiotics or steroids.” We strongly believe in eating sustainably so we were psyched. How did Almquist, an ex-marine, come to open a butcher shop? “I was on a personal mission to find the best steak of my life,” he shared. The only way to do it, in his opinion, was to buy the whole steer, do he did. He realized that others wanted meat this good but were unable to buy an entire animal. “I saw a need to fix the local food chain in my home town,” he said, “so I created a fair and equitable way to make it happen for everyone.” He opened the shop and deli on Easter weekend in 2014. Menu: Currently the menu is small. Boar and Bull offers two kinds of smoked meat sliders, brisket and pulled pork, along with two sides: beans made with the house barbecue sauce, Bacon Mac (bacon ends, elbow macaroni and house-made teriyaki aioli), and nachos. Almquist plans to introduce a full menu shortly; check the website before you go. There are local draft microbrews and all-natural Boylan soda right out of the fountain. It’s made with pure cane sugar instead of high fructose corn syrup. Sourcing is important at Boar and Bull. Thoughts: Boar and Bull is a butcher shop that happens to offer delicious melt-in-the-mouth smoked meats along with a few sides. It may not be traditional BBQ but it’s darned good! The ambiance at the counter shop is decidedly no-frills, but if, like us, you’re in search of good barbecue, it won’t matter. For us, the thrill was eating good quality smoked meats and looking at the gorgeous meat in the display case, fantasizing what we’d cook with it. We also enjoyed talking meat with the committed butcher. The brisket sliders, made with meat aged in-house for 14 to 21 days, are topped with a hand-crafted BBQ sauce, dill pickles and onions. The Hawaiian Pulled Pork version is topped with pineapple, onion and the tangy teriyaki aioli. We didn’t get to taste the sides. Almquist wants to serve the freshest food possible. Since it was Saturday of Labor Day Weekend, a busy day for a meat market, he didn’t have time to make new ones. If you needed more than the sliders there are bagged potato chips available. There are two sliders in an order. We shared the brisket sliders and still hungry we ordered the pork. If you want to taste both, ask for “half and half;” you’ll get one of each. The meat is smoked daily in-house in an electric smoker. Almquist introduced a full menu a while back but he had cook problems and it was pulled. He’s got the menu designed and hopes to implement it shortly. If the food we tasted is any indication, it will be good and you know the meat is the best there is. Boar and Bull is more than a butcher and deli. On Friday and Saturday nights they offer entertainment. Almquist says the comedy and rockabilly nights are the most popular. (You can find a full schedule on their website.) Besides food, patrons can get microbrews from local brewers including Grimm Brothers and Big Thompson Brewery in Loveland, City Star in Berthoud, Oskar Blues in Longmont and a host of Fort Collins breweries. They also offer two gluten-free ciders from Wild Cider in Firestone, Colorado. 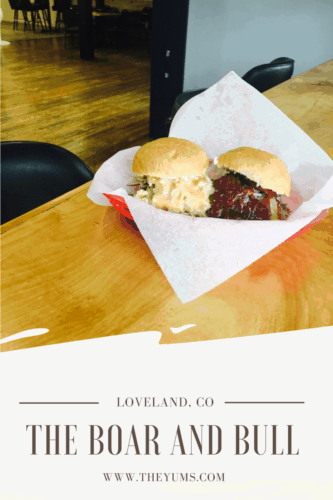 If you’re looking for a quick bite in Loveland and are a fan of great ‘cue, head for Boar and the Bull and try those sliders. We want to get back to taste the expanded menu when it’s up and running. Prices: Sliders (two to an order) are $8. Nachos are $8 (for an additional you can add either brisket or pulled pork). Sides are $2 each, 16-ounce draft microbrews and cider are $5, soda is $1.50 with free refills.